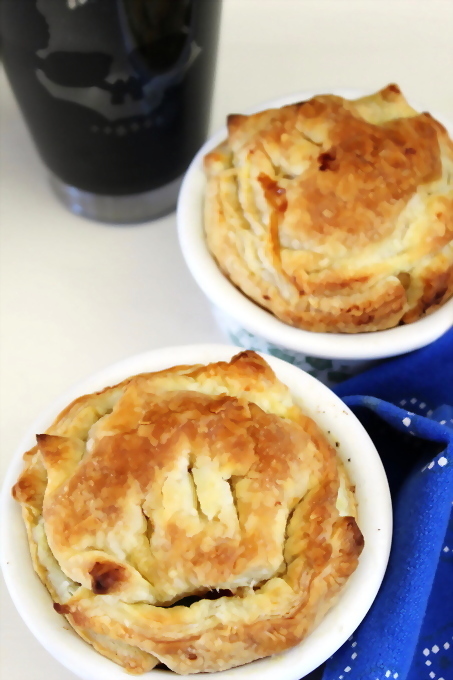 Mini Veggie Pot Pies are a delicious addition to any weekday dinner. They would also be a filling lunch all on their own. 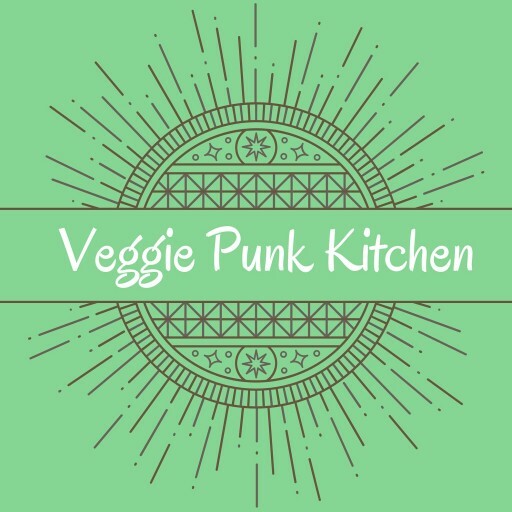 Mini Veggie Pot Pies are one of the most delicious compact meals I’ve ever made. A golden, flaky crust cradling veggies that are bursting with flavor. I remember eating the store-bought version for dinners with my dad when I was a kid. This is a fresh & savory update. It spends about the same amount of time in the oven. 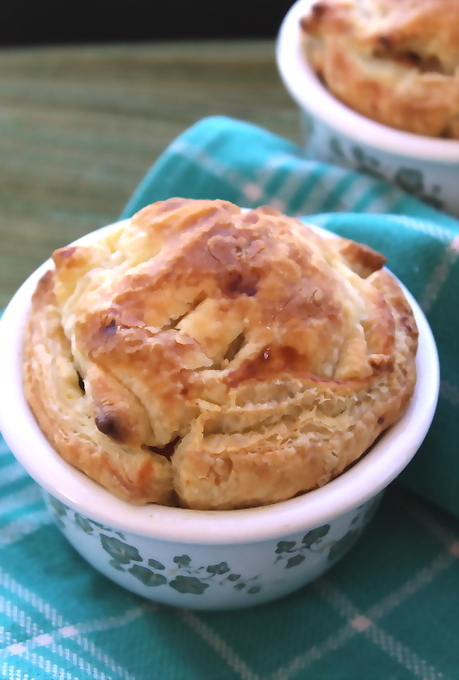 Mini Veggies Pot Pies can easily be customized to feature the best vegetables from any season of the year, including white asparagus, carrots, green beans, and peas in the spring or okra, zucchini, and tomatoes in the summer. If you want a meat-like texture & taste you can add some mushrooms. Beyond Meat Beef Free Feisty Crumbles. Dice some Gardein Chick’n Scallopini after cooking to package directions and viola! Chicken pot pie. The light, buttery, flaky crust on the Mini Veggie Pot Pies is almost my favorite part of the pie experience. I did cheat a little with the Pepperidge Farm puff pastry sheets though. Dough is not that hard to make. I’ll include a quick guide to whipping up a batch that you can use instead of a commercial brand. Cut the butter into small cubes and add to flour. Gradually drizzle ice water into the bowl, mixing with the fork until the dough holds together. Quickly shape the dough into a ball and flatten into a disk. Place on a floured surface a roll out to 1/8 inch thick. Place the ramekins upside-down over the dough and use a paring knife to cut out circles about 1/2 inch larger on all sides. Or 2 circles, one circle about 2 1/2 inches wider to form the bottom and sides, smaller one on top, pinch edges of each together once you have added the veggies. The best part of having extra dough left over? Rolling it up into 6 inch long strips and imprinting it with a fork like I’m edging a crust. Because I am! Extra pieces to add to the baking sheet when the pies are still in the oven. 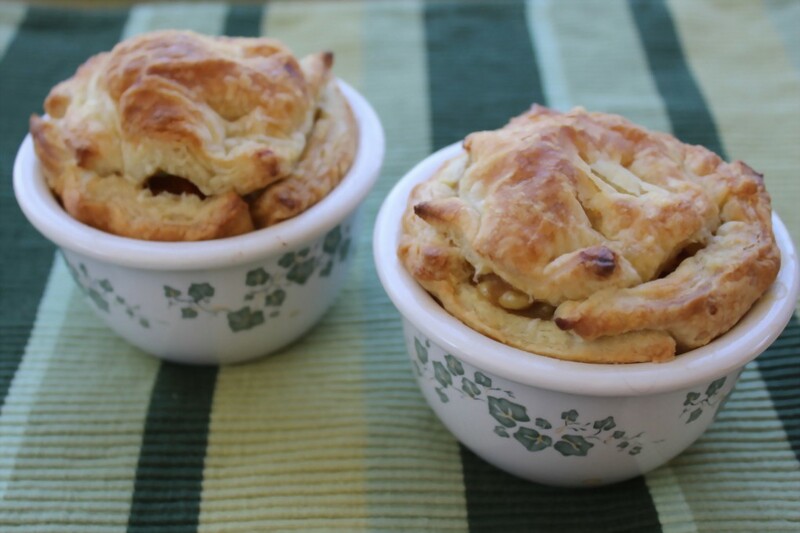 But back to the Mini Veggie Pot Pies! If they don’t get snapped up and eaten, you can freeze them and enjoy them later. Hide the ramekins behind the unidentifiable lump wrapped in plastic that no one will touch.